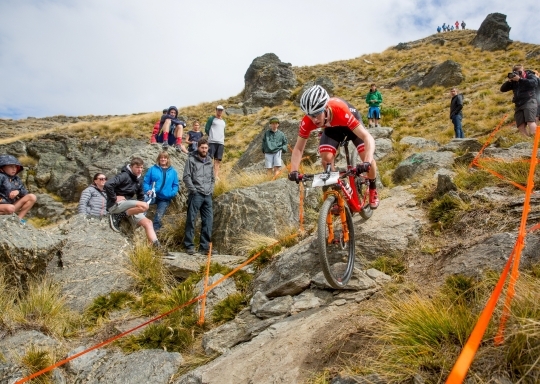 Cooper, the former Junior and Under-23 World Champion, missed much of last year out with illness and chronic fatigue, grabbed the National Title in emphatic fashion at the Cardrona Alpine Resort.This is a greaty debut to the season after return to Trek, the company with whom he won his first World Title. Cooper, based in Christchurch, pushed into the lead before the single track on the opening lap, and was never threatened, going on to win in 1:23:21. He finished nearly four minutes ahead of Ben Oliver, 20, a member of the Cycling New Zealand’s MTB National Performance Hub. Porirua’s Jack Compton, 21, was third, two minutes behind Oliver. The winner was delighted with his progress back into the sport. “I am happy with how the race went. I was not planning to, but I got to the single track first and then I was able to control my whole race. I took some care down the rock garden and didn’t want to puncture and it worked out well,” said Cooper. Anton takes on the Oceania Championships in Australia in two weeks. “That’s the next stepping stone and then I'm off to California and then Europe and it will be non-stop from there. I'm feeling good but I have a lot of room to improve which is a good thing. The amount of time I had off due to my illness is very significant for an elite athlete. It may take the whole season gradually building up and I will take it carefully to keep finding form. That is very exciting for me."